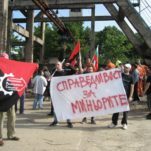 The miners from Obrochishte – the third largest manganese mine in the world, located in eastern Bulgaria, went on wildcat strike on 01.06.2017. The strike was supported by the anarchosyndicalists from ARS (Avtonomen Rabotnicheski Sindikat / Autonomous Workers Union), while the bureaucratic union in the mine opposed the strike and sided with the bosses. 17 miners from the day shift refused to come out of the mine and stayed underground for 5 days. All the workers from the other shifts, around 150 people, joined the strike. The miners, alongside with the anarchosyndicalists, blocked the main portal so the trucks of the company could not get the goods out. The strike broke out after the management refused to comply with the collective bargaining agreement that was signed earlier this year. The collective agreement was the result of similar strikes in March, when the miners went on hunger strike and organized mass protests to demand raise in salaries, improvement of the working conditions and review of the mining concession contract. Wages in the mine are extremely low – between 230 EUR ( the minimum wage in Bulgaria) and 305 EUR per month. Workers do not receive the necessary equipment, no food vouchers, they don’t have transportation provided and the working conditions in the mine are terrifying. The current 25-years concession contract for the mine was made back in 1999 by the right wing government of Ivan Kostov, famous for his mass privatization policy. For the last 18 years, the private operator of the mine – “EuroMangan”, failed to comply with any of the concession agreements, which led to ecological and social disaster in the region. During all those years not a single inspection or regulation was made by the authorities. The organization is owed by a Cyprus offshore company with unclear ownership, but the day-to-day operations are managed by a women named Teresa Dankova, famous among the workers as ‘the satan’. She regularly insults the miners, refuses to sign their papers for their social benefits and once she even refused to open the gates for an ambulance to pick up a heavily injured worker. During the March strike, the CEO of “EuroMangan” David Wellinges called the miners’ demands – “an extortion”. Nevertheless, following pressure from the workers, and through the mediation of the Minister of Energy and the Ombudsman, a collective labor agreement was signed, which stipulated an increase in salaries (albeit with the pitiful 75 EUR), transportation for the workers and also the employer made a commitment to abide by the labor laws. But it turned out the collective agreement means nothing to the company. They have so far failed to fullfil any of the agreed terms. Furthermore the management has yet to pay salaries for April. That’s why the miners went on strike again, but this time with more radical demands – they want all the bosses to leave the mine for good. The strikers got a lot of media attention and solidarity. Autonomous Workers Union organized actions of solidarity with the miners in the capital city of Sofia. Workers from the Varna’s section of the union (the closest big town to the mine) joined the strikers in their blockade and raised money for food supplies. The strike ended on 05.06.2017 when the government officials stepped in, “freezed” the concession and gave 14-days term to terminate it permanently. With this semi-victory, the miners went out from the underground after 5 days, but said that the blockade of the mine stays, as well as strike-readiness, and that if the bosses return after the 14-days term, they will resume the direct actions. In that period, Autonomous Workers Union plans to organize more solidarity actions as well as protests in front of the ministry of electricity (the ministry that is in charge of the concession), so it can put pressure on the officials to comply with the workers’ demands.